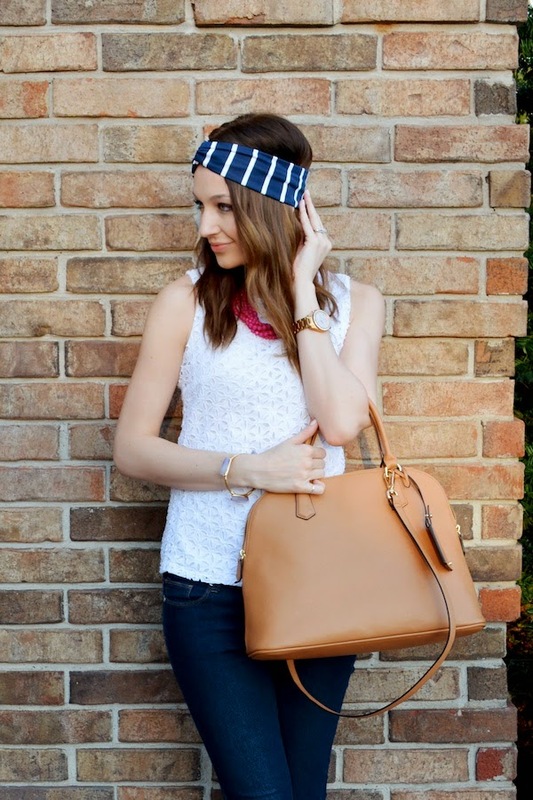 One of my favorite ways to add a little 'vavavoom' in the spring and summer (or to cover up humidity-stricken or unwashed hair) is wearing headbands! I'm loving my new navy & white turban headband from Do-Da Wraps, and it's going to be perfect for anything from work (like styled above) to a top knot at the pool. Do-Da Wraps is a new favorite Etsy shop, and I love Sarahn's quick turnaround time, adorable fabrics, and wonderful customer service. Something I really liked was that any of the fabrics on her Etsy page can be made as a headwrap or the turban style, and that my headband is smooth and stretchy (much more comfortable than headbands I've owned in the past). Be sure to check out Do-Da Wraps, and take 25% off your entire order with the code 'JACY25'! why be so cute for! seriously, adorable outfit. jealous of your ability to rock headbands. I love how you are rocking that headband! I need to be brave enough to try it out! You look amazing! How cute are you!! Loving this headband on you and I love your shoes!!! Gorgeous as always! I love her headbands too! They're really comfy! You are ROCKING this outfit girl! I love the headband too! Cute top and you sure can rock a turban. You look gorgeous. I love the accessories you added to make this basic outfit your own! I love the headband on you! It's such an adorable touch to this outfit! I love your headwrap and these wedges are absolutely adorable! 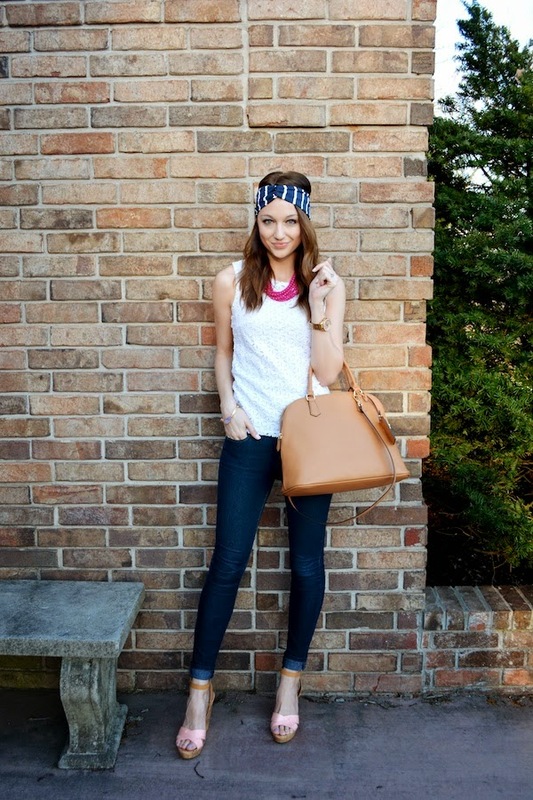 You are rocking this look- and I have those same wedges and LOVE 'em! They look great on you, babe! You pull off the head wrap so well! Love the white eyelet too, that is my favorite thing to wear in the summer. I LOVE your headband! They are so underrated these days but can really do wonders for a look! maybe you have shared this before, but where do you currently live? I live in the Springfield, Missouri area!